The Minnesota State High School Boys Hockey Tournament has been seen on six TV stations and a number of talented broadcasters have been calling the action leading to a state title. Here’s a look back at state tournament TV coverage over the last 60+ years. In 1956, the first televised games of the tournament began. A Twin Cities television channel (KEYD, Channel 9) broadcast the two evening games on Thursday. They also did the Saturday championship game. The process of televising games was discontinued until 1961 when the Twin Cities lone independent station was WTCN-TV (now KARE 11) televised the championship and third place games held from 1961 to 1978. WTCN also broadcast local; Twins, North Stars, Gophers and other State High School Tournaments. 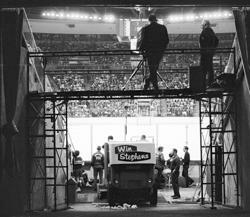 Back then, the tournament was played at the dark confines of the St. Paul Auditorium, and moved to NHL Arena Met Center in Bloomington in 1969 before moving back to St. Paul in 1976 held at St. Paul Civic Center. The coverage was very basic, nothing flashy. The one thing that stood out were the features on the schools as well as the towns that participated in each tournament. Most of those segments were filmed pieces. Calling the action was the station’s sports director at that time Joe Boyle. Also handling the play-by-play as well as the color was Roger Buxton. One other thing about WTCN’s coverage was that instead of leaving the arena to go to a commercial during a period, there would be a small visual at the top of the screen with a voice over. Things were changing in Twin Cities TV in 1979, WTCN lost its independent status and became an NBC affiliate, KMSP left ABC and became an independent and KSTP left NBC for ABC. And speaking of KSTP, the station got the rights to the state hockey tournament that year. What was different about their coverage from Channel 11’s is that the station used more on-air personnel such as Bob Bruce, Ed Karow, Robb Leer and the former PA Announcer for the North Stars, Bob Utecht. When they first broadcast the tournament in 1979, the station brought in celebrities to celebrate their new ABC affiliation, among the celebrities who came to the tournament were: Cheryl Tiegs, Richard Dawson and Howard Cosell. Cosell would also sit in with the man who would call the action for every state tournament game broadcast, the Voice of the North Stars, Al Shaver. In March of 1980, they also used a color commentator, the man who led the USA Hockey Team to the gold medal - Herb Brooks who was in St. Paul alongside Al Shaver less than a month following the 1980 Winter Olympic games. According to John Carman’s column in an edition of The Minneapolis Star he mentioned that Shaver was the star of the tournament for his outstanding play-by-play while his cohorts add as much as the color of the ice. Fans who couldn’t get tickets to the Civic Center got to hear one of the best play-by-play men in this market. KSTP carried the tournament until 1982. Then came the period from 1983 to 1991 that would be considered “The Golden Age of State Tournament Coverage.” WCCO-TV bought the rights to the event and it turned out to be an all-station undertaking with Mark Rosen and Ralph Jon Fritz as studio hosts and other station personnel handling between periods and games features. The best move the station made was bringing in outside help to handle the play-by-play. In 1983, veteran Canadian broadcaster Don Chevrier would call the action for several games and also brought in was then Wisconsin badgers broadcaster Paul Braun. The following season, Chevrier was replaced by fellow Canadian Chris Cuthbert, who handled the remaining years of WCCO’s coverage. But what set the station’s coverage apart from its two predecessors was the outstanding camera work and production. The overall sound and vision looked more like a network quality broadcast. When the state hockey tournament went to a two-tier affair in 1992, the TV rights would be picked up by KMSP-TV. The station had a long run carrying the event and used talent such as the station’s sports directors Perry Williams and his successor Jeff Grayson. Handling the play-by-play over the years would be two men who today are broadcasting Gopher hockey today Doug McLeod and Wally Shaver. Shaver was behind the mic when Duluth East and Apple Valley played in the 1996 semifinal game that went into five overtimes. The one beef about KMSP’s coverage was that between games, instead of running features or interviews, they would run news. Still, the station had a long run with state tournament coverage, including football and basketball. In 2004, a new era would begin that still continues to this day when independent channel KSTC-TV entered into a partnership with the Minnesota State High School League to carry football, basketball and hockey. When the station started carrying hockey (they also carry the girl’s semifinals and finals) Dan Terhaar would handle the play-by-play. Also handling the action was Clay Matvick, now with ESPN. 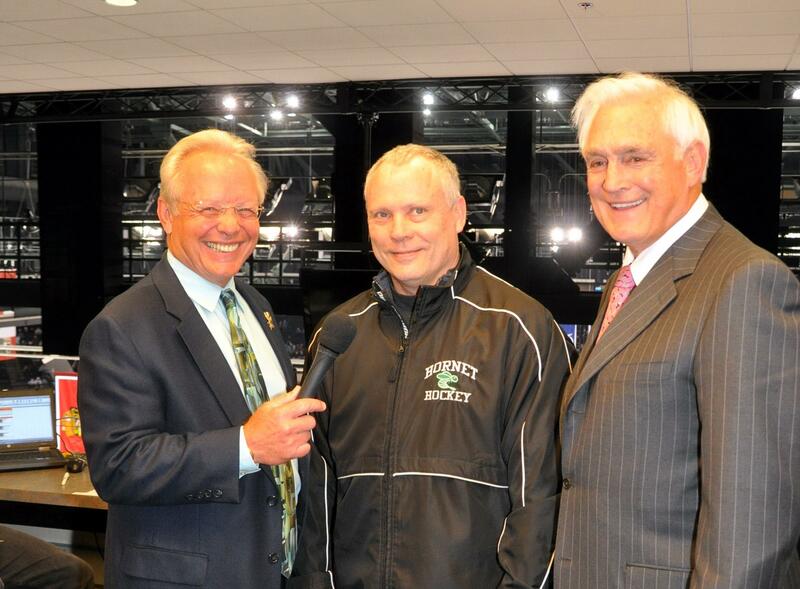 In 2014, the station brought in veteran hockey broadcaster Gary Thorne to work the Class AA tournament, but was unable to come back again due to commitments with the Baltimore Orioles so the station is utilizing Jim Erickson for both classes. The one thing that makes their coverage stands out is the direction, the replays are outstanding, especially the ones from the overhead camera. For the 75th Anniversary State Tournament in 2019, former Minnesota North Stars player, Coach and G.M. - Lou Nanne celebrated his 55th year as color commentator at Boys State Tournament that began as a fledgling reporter in 1964, three years before the North Stars were a team. In 2019, Sloane Martin of WCCO Radio, and a veteran sports broadcaster became the first female play-by-play individual to cover the Boys' Tournament, when she called the first session Wednesday Class 1A double-header sessions, and 1A quarter-finals. KSTC will eventually have the longest run of any station carrying the state hockey tournament since they hold the rights until 2021.